It's rare to read a book from DC Comics wholly disconnected from the rest of the DC Universe, and unfortunately those books usually face the same fate as The Movement ultimately did. I had thought Movement Vol. 1: Class Warfare related to writer Gail Simone's Batgirl run, but those ties are not explicit, at least in the first volume. Irrespective Simone's Movement is enjoyable and ostensibly political, suffering only from the fact that it skips much of the "how" of building a groundswell movement in favor of the later moral "what's next" questions. To that end, even as it was meant to be a foil for (if only in DC's advertising) Art Baltazar and Franco's rich-kid Green Team superhero book, the Movement heroes still seem to have unlimited food, electricity, internet, technology, and so on. There's a fine tale here of Movement's Coral City heroes and citizens versus a corrupt administration and the police caught in the middle, but it's hardly a realistic depiction of this kind of political movement, if one is being sought. Movement demonstrates itself as something else at the point in which Movement leader Virtue banishes the Coral City police chief from a church during a hostage crisis-in-progress. Ordinarily the superhero figure might rescue or assist the police; instead, not only does the Movement take over a neighborhood (called, with not a little irony, the "'Tweens"), but takes on as a teammate the issue's seeming villain. Further we find in the second issue that the Movement has themselves taken prisoner two corrupt police officers, such to show that they may be super-powered but they're not necessarily clearly "good" in the story. The imprisonment of these two officers -- caught on camera threatening to sexually assault a minor -- delivers much of the internal conflict of the Movement during the story. Some see the imprisonment and subsequent show trial to be just; others think holding the officers against their will is no different than what the Coral City police might do. Simone effectively evokes the voice of citizenry pushed past their limits; indeed on every level of Movement, from the heroes to the police and even to corrupt businessman James Cannon, there's a theme of people feeling powerless in the face of the power of others. At the same time, the themes Simone addresses almost immediately in Movement are entirely un-Movement-y, from illegal wiretapping to imprisonment without trial. The Movement is supposed to be the 99%, but their dilemmas are largely the trouble of Big Brother (to mix metaphors). It's for this reason I might have liked to see more of the Movement-in-process (which, for all I know, Simone might address in the next volume). The problems the Movement is having now are "made it" problems, the kind that crop up when the underdog ends up in charge. Again, there's a plenty interesting story here, but it's hard to really empathize with the Movement's "movement" status when we're dropped immediately into the middle of what seems to be the end of the Movement. I'm skeptical that Simone's point is that no "movement" really can be a "movement" without eventually devouring itself and becoming "the man," but to some extent that seems this volume's thesis. Whenever I pick up a Gail Simone, especially one a bit more out of the mainstream than Batgirl or Birds of Prey, of course I'm looking for the kind of diversity and complexity of her original Secret Six. Though admirably starring an almost entirely female cast, Movement offers only a minor suggestion of any sexual diversity, and nothing nearly as tough to define as Bane and Scandal, for instance. Simone brings back Tremor Roshanna Chatterji from Secret Six, who I believe had been established there as asexual (can't recall if it was on the page or if Simone stated it separately), but such isn't addressed in this volume (some foreshadowing suggests it might come up in the next). Also though again admirably the characters all seem to have various nationalities, I didn't feel the characters necessarily "lived" their nationalities realistically on the page aside from brief origin flashbacks. I admit to pausing when I saw Freddie Williams handled art through the book. I'd previously had a lot of difficulty with Williams's seemingly-distorted, often repetitive art on JSA All-Stars, though I did like it more recently on the New 52 Captain Atom; still, I wasn't sure if Williams was right for the grittier Movement. Here, the art was fine and not a distraction; occasionally two characters move around one another in a space in ways that don't hold up under scrutiny (the police entering the church, for instance), but those are minor concerns. There's choices being made here however, that for instance unrepentant Officer Whitt should be drawn by Williams as absurdly big and blocky. The visuals of Movement present Whitt as a bad guy, which he is, but even so the art doesn't leave room for shades of gray or letting the reader decide for themselves, which Movement's politics would profess to encourage. Similarly Cannon, with his bikini-clad body guards, is melodramatically evil in a way that makes the book over-the-top. The book works at some cross purposes here, on one hand trying to "realistically" spin a superhero tale through the lens of the "Occupy" movement, but then on the other hand undercutting some of the realism of that by using a larger-than-life aesthetic. I don't know how much of what Gail Simone wanted to do with The Movement she actually gets done, but as in many cases the second volume ought help either mitigate or exacerbate some of what stuck out to me here. Movement Vol. 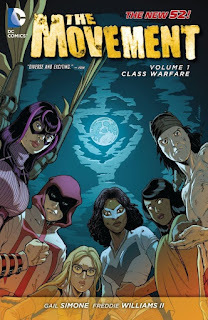 1: Class Warfare is good work from Simone; it is not on par with Secret Six (though it's hardly fair to compare the first volume of Movement to later volumes of Secret Six), but it is enjoyable storytelling and different from the everyday. Huh, this sounds relevant to my interest in superhero-stories-as-revolutionary-narratives, though perhaps a little disappointing if Simone shies away from the actual "movement." I'll have to check this out-- I totally forgot it had ever existed.